If somebody says "spy movie" the first thing which comes to mind is James Bond. Yep, car chases, million dollar gambling in Monte Carlo and gadgets that do all sorts of nifty things. But did the movie producers of the Bond films or even Ian Fleming for that matter actually capture the real world of all those anonymous people who live in the shadows? This movie is based on the 1974 book by the same name written by John le Carré and represents the antithesis of everything we the viewing public have come to expect from the cinematic hyperbole of James Bond or as of late, Mission Impossible. Like anything connected to the government, the film portrays the protagonist as a dutiful employee who is awash in fatigue, boredom and probably his own fair share of cynicism over the state of affairs. This movie is the thinking man's spy film. Someone accustomed to the nonstop thrill ride of an action film will find this film slow, plodding and downright boring. However it is in that very slowness we watch a gem of a mystery unfold as the central character methodically deduces who in the British Secret Service is actually a mole, a double agent working for the Russians. Remember that the year is 1973 well before our modern era of computers, cell phones and PDAs and it is hard to believe that anyone could conduct any business or even live their life without the electronic devices we all now take for granted. Talk about primitive! John le Carré wrote with a realistic approach to his stories. After all, he spent the 50s and 60s working for the British intelligence services MI5 and MI6. His first big novel, The Spy Who Came In From The Cold became an international best-seller when it was published in 1963 and led to the 1965 film starring Richard Burton. It was here that the author set out a writing style which was anything but flash and glamour. While Ian Fleming, for instance, clearly set up the fight between good and evil, both good and evil being well defined, le Carré described the complexity of the moral dilemma between the West and East. The democratic West was not necessarily the good guys dressed in white and the communist East was not necessarily the bad guys dressed in black. There were many shades of gray in the mix and like today's on-going debates about the effectiveness and moral questions of water-boarding or the perpetual lock-up at Guantanamo Bay without trial, le Carré is sometimes asking if we are still good if we in turn follow the aphorism "fight fire with fire" and end up being just as evil as our enemies. Gary Oldman puts in a wonderful performance as George Smiley, brought out of retirement to find out whom amongst the higher-ups at the Circus (British Intelligence) is a long-term mole. The story moves between the current investigation and the past when Smiley was still working for Control, the previous head, played by John Hurt. Oldman and Hurt personify the old, wizen men who have been through it all and seen it all; they were actually there for Genesis chapter 1, verse 1. Unlike our more spectacular detectives (Sherlock Holmes: A Game of Shadows comes to mind), this story imparts the sleuthing aspect of uncovering the mole and sleuthing involves the dull plodding through a ton and a half of documentation trying to piece together the puzzle of how the Russians could have set up a mole so high up in the organisation. There are several sorrowful side stories which flit by but make you wonder what they may entail. Smiley has an estranged relationship with his wife. She has had an affair and it turns out the affair was with a work colleague of Smiley's. Smiley tells Peter Guillam, an intelligence officer aiding Smiley in the investigation, to clean up his affairs as they are all going to be scrutinized for their work in trying to uncover the mole. In a short scene, Peter at his flat tells another man he must leave. Little is said; little is shown but it's 1973 and Peter is a homosexual. It is a truly sad moment as the camera shows the other man dropping his keys on the table as a few tears stream down the Peter's cheek. Quite simply, I enjoyed the movie. Although to any potential viewer, I would add the caveat that this spy film is anything but the eye-candy you would normally associate with the genre. A number of action films rack up a body count that extends well past your fingers and toes and you would do well to arm yourself with a clicker-counter. Does anybody realise that a mystery by Agatha Christie usually has only one murder per story? The film is a beautiful period piece and does a wonderful job of capturing the era. It also captures the realism of life and the dullness of a government job. This all provides an excellent backdrop for the out of the ordinary solving of a mystery. While many may find the action as exciting as watching paint dry, I found it all to be absolutely mesmerising. The subtlety of the acting was riveting. I must however add a caveat to the story. It is complex and as such, it is difficult to follow. It has been years since I read the book but I have come to recognise that a film adaptation, any film adaptation suffers from the constraints of its medium. A novel, the written word, has a great deal of freedom in presenting ideas and developing a story; this may entail descriptive passages or the thoughts of the various players. Unfortunately, a film must make trade-offs and sacrifices especially in accounting for running time which sometimes means that what's good in the book may end up on the cutting room floor. I remember finding the book The Da Vinci Code to be fabulous but the movie to be only so-so. Nevertheless, this film does manage to stand on its own. Clocking in at 85% on Rotten Tomatoes, the film has garnered a lot of praise from the critics which to me is always a sure sign the film is good and worth seeing. Nevertheless, I remind you that this is anything but a James Bond spy flick. This is dark and brooding, very much a reflection of reality with its jadedness about everyday life. 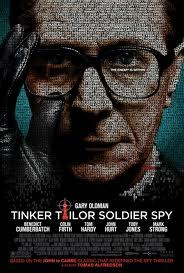 Tinker Tailor Soldier Spy is a 2011 British espionage film directed by Tomas Alfredson, from a screenplay written by Bridget O'Connor and Peter Straughan based on the 1974 novel Tinker, Tailor, Soldier, Spy by John le Carré. The film stars Gary Oldman as George Smiley, and co-stars Colin Firth, Tom Hardy, John Hurt, Toby Jones, Mark Strong, Benedict Cumberbatch and Ciarán Hinds. Set in London in the early 1970s, the story follows the hunt for a Soviet double agent at the top of the British secret service. Tinker, Tailor, Soldier, Spy is a 1974 British spy novel by John le Carré, featuring George Smiley. Smiley is a middle-aged, taciturn, perspicacious intelligence expert in forced retirement. He is recalled to hunt down a Soviet mole in the "Circus", the highest echelon of the Secret Intelligence Service. In keeping with le Carré's work, the narrative begins in medias res with the repatriation of a captured British spy. The background is supplied during the book through a series of flashbacks. In 1979, Tinker, Tailor, Soldier, Spy was adapted to television as a seven-part series for the BBC, featuring Alec Guinness as George Smiley, of the SIS; the initial broadcast coincided with the British Government announcing that Anthony Blunt, the Keeper of the Queen's Pictures, was one of the Cambridge Five traitors. In the United States, the Public Broadcasting Service (PBS) broadcast it as part of its "Great Performances" series, introduced by the Canadian journalist Robert MacNeil, who explained the workings of SIS. David John Moore Cornwell (born 19 October 1931), who writes under the name John le Carré, is a British author of espionage novels. During the 1950s and the 1960s, Cornwell worked for the British intelligence services MI5 and MI6, and began writing novels under the pseudonym "John le Carré". His third novel The Spy Who Came in from the Cold (1963) became an international best-seller and remains one of his best known works. Following the novel's success, he left MI6 to become a full-time author. The spy novel œuvre of John le Carré stands in contrast to the physical action and moral certainty of the James Bond thriller established by Ian Fleming in the mid nineteen-fifties; the le Carré Cold War features unheroic political functionaries aware of the moral ambiguity of their work, and engaged in psychological more than physical drama. They experience little of the violence typically encountered in action thrillers, and have very little recourse to gadgets. Much of the conflict they are involved in is internal, rather than external and visible. Unlike the moral certainty of Fleming's British Secret Service adventures, le Carré's Circus spy stories are morally complex, and inform the reader of the fallibility of Western democracy and of the secret services protecting it, often implying the possibility of East-West moral equivalence. You have to enter a code to get into the web site. Get it? It's a "spy" movie. The code is 160911 but don't worry. If you leave the field blank and click on the Enter button a couple of times, it will be filled in for you. In case you don't get the significance, the movie came out in the U.K. on 16-09-11. "Tinker Tailor" is a counting game, nursery rhyme and fortune telling song traditionally played in England, that can be used to count cherry stones, buttons, daisy petals and other items. ... Its American version is commonly used by children for "counting out," e.g. for choosing who shall be "It" in a game of tag.